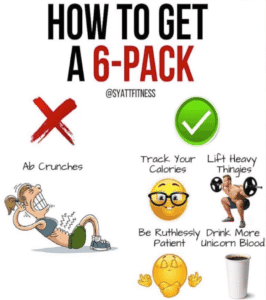 Today, I am going to use a meme that a fellow trainer, Jordan Syatt, created to help people understand how to get a 6 pack. When I was younger, that was all I wanted. My ultimate goal was to get 6 pack abs. Don’t act like y’all aren’t the same way! Getting a 6 pack seems impossible and for good reason. It is one of the hardest things in the world to accomplish. But it is possible! If I can do it, anyone can do it. Let’s break down this meme so you can better understand how to get 6 pack abs. A lot of people think you have to do a lot of ab isolating work to get a 6 pack. They think you have to do crunches, sit ups, and v ups all the time. That is not true. I did very little abdominal specific exercises to get my 6 pack. You have to work your entire body to make your abs visible. That means reducing body fat and building muscle everywhere. For me, I found that precision nutrition and high intensity cardio were key. This bring us to the next point. When you first start losing weight, you may think that all you need to do are high repetitions with low weight. While that is a great way to start off in order to perfect your form, you will eventually have to move on to heavier weights. I always tell my clients to start with lighter weights so their bodies will learn perfect form. However, your body will eventually adapt to those high rep ranges and will stop responding. You will need to do a mix of low reps with high weights, medium weights and medium reps, and high reps with low weights. Getting a lean, athletic body is key to getting a 6 pack and you can only do that by lifting heavy weights. Fat loss is not a linear process. As much as we would like it to be, it just does not work that way. You must be patient and consistent. There will be weeks and maybe even months where your body fat percentage will not budge. You will be doing well and losing fat and then one day, it will just stop, even though you are doing everything correctly. The timeline you have in your head for a 6 pack is not correct. You should at least double it in order to have realistic expectations. Unicorn blood is a Jordan Syatt thing. He is an avid coffee drinker. I am too. I drink so much black coffee because I fast 16-18 hours every day. I am not sure I could do that without my coffee! However, this is not a requirement for getting a 6 pack. Black coffee has many health benefits, but if you do not like coffee, do not despair! Washboard abs are still within your reach. I do not want to discourage anyone, but it is very difficult to get 6 pack abs. It takes a lot of work, patience, and dedication. Once I got mine, I decided they were not really worth it. However, I know you are not going to listen to me and try to get them anyway. So, follow the instructions in this blog and put the work in. Be prepared for the journey to take a while and do not get discouraged. You can do it!